Doodlebug is 11 months old now. She’s walking, investigating, exploring, disrupting, playing, taking, pulling, chewing, and charming us to pieces! Her new mobility has required some creative solutions to any material object living at the 3 foot or below level. 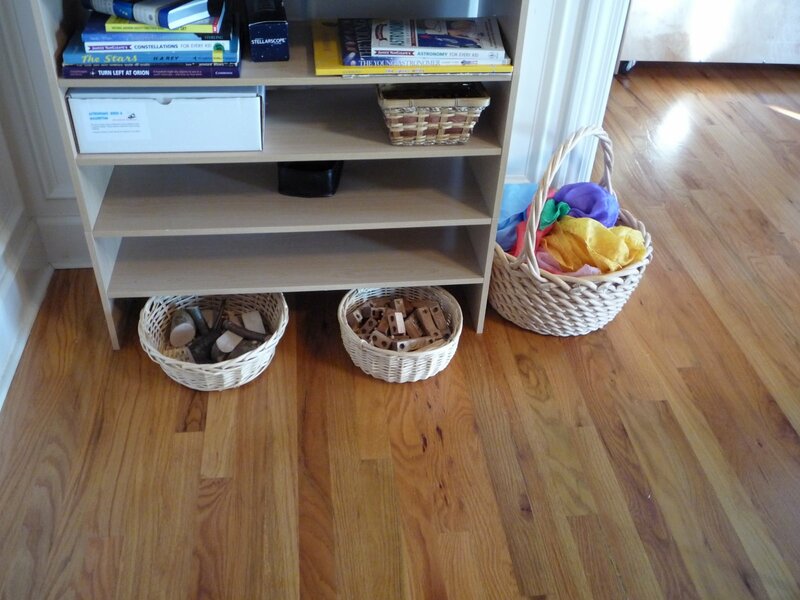 It meant that many of my Montessori materials (the ones with smallish pieces) had to be put away…just for a season. 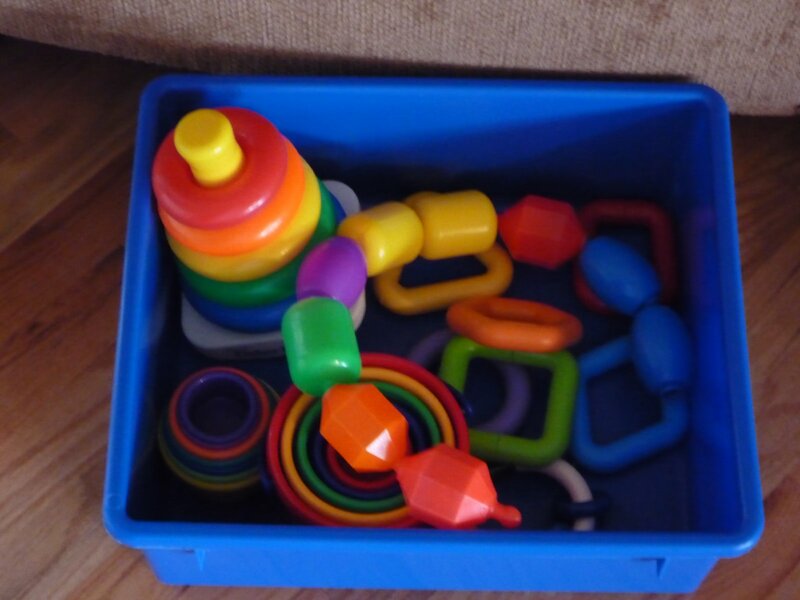 (Actually, my Kinder-spaces idea is very Montessori inspired – it’s more of a baby/toddler environment encouraging play and connections – the same freedom within limits I offer an older child on a tray of materials!) Doodlebug will grow quickly enough and I’ll be able to set out more Montessori materials soon, but I wanted this time when they were unavailable to be just as fruitful and joyful for the littlest children. I wanted to set up some spaces for them that were attractive and allowed for play and investigation and exploration safely and without overwhelming. I spent a fair amount of time contemplating these tiny Kinder-spaces for both Doodles and Peanut. 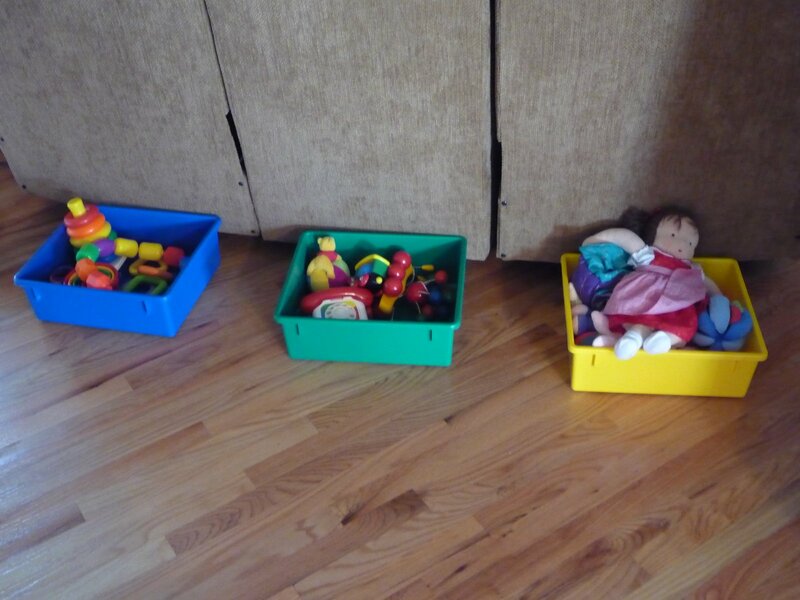 Before I accomplished these play spaces all of Doodlebug’s toys were in a big laundry basket in the living room. One or two toys were played with at most – or the contents of the entire basket was dumped on the floor. Either way, it just wasn’t attracting play. I decided to set up small little play areas with toys grouped into themes of play and set out attractively, within reach, and spread all throughout the living area of my house. I think it’s working nicely, so I thought I’d share. 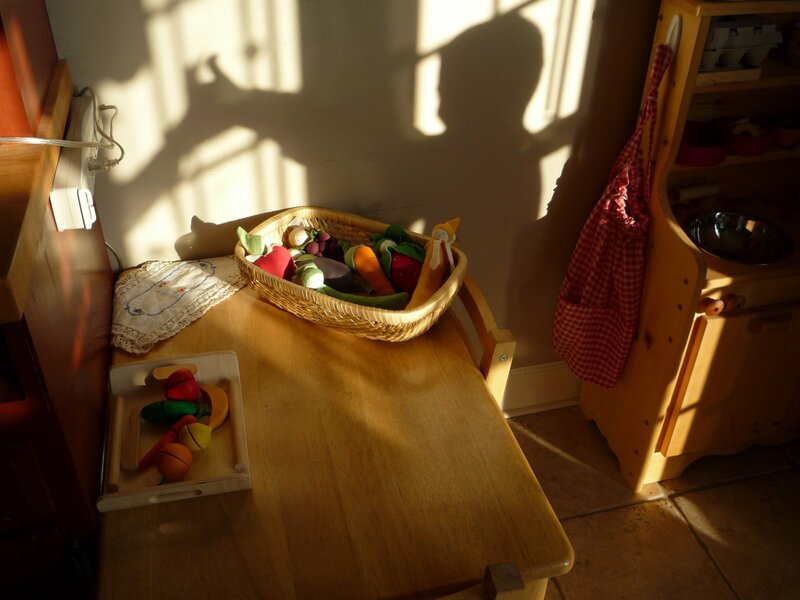 I thought it might be fun to take you on a tour of my house and I’ll show you the Kinder-spaces we set up, some especially for the Doodlebug, some for Peanut, but all I think are lovely little play spaces. Next to our kitchen is a small table. I wanted to show you the basket of fabric fruits and veggies and the small tray of wooden veggies. If you look closely you can see that the wooden veggies velcro together – there is a small wooden “knife” for cutting them apart. This is Peanut’s favorite thing to play in the kitchen. And, it’s Doodlebug’s favorite thing to take apart! She lives for the moment when someone matches the two halves and hands the whole to her. She delightedly manipulates them apart! This is such a fun little mini-dollhouse! All of the pieces are nesting. This tiny house has captured all of our imaginations. Sometimes, the pieces are used to make roads, ramps and bridges. Sometimes, the little house is all set up. And sometimes, Doodlebug is just gnawing on the roof! 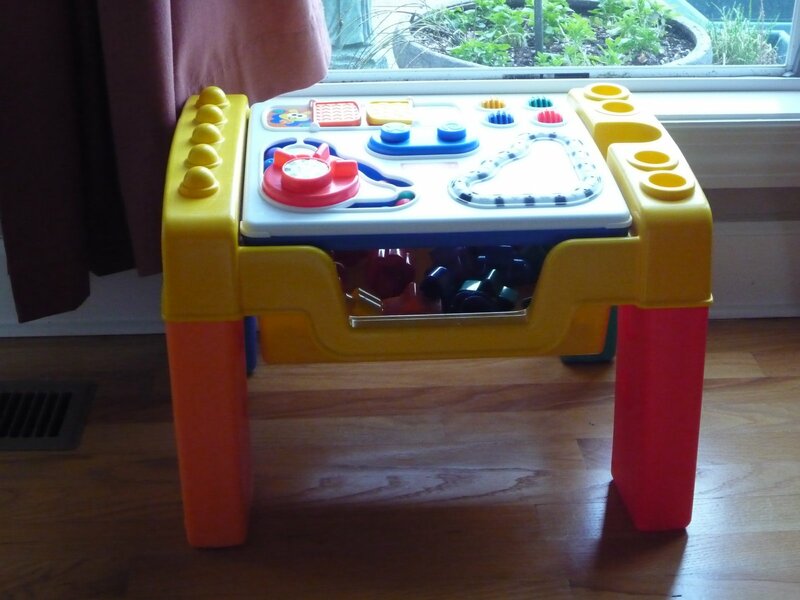 Next, we have a small little lego/duplo type table (I won’t link because it’s easy to find these and mine is years old, so I don’t know if it’s even made like this anymore). I’m not sure how many children have used this – 3 maybe? But, it is such a help when the little one is pulling up and starting to stand. It provides so many hand holds. These days, I can usually find the doodlebug sitting inside the little yellow tray (that top tray comes off) chewing on a toy. …is this ball track. I’m pretty sure my sister gave this to Peanut on his 1st birthday. It was a delight then, and Doodlebug finds it a delight now. She love watching the ball race to the bottom…of course, we might have lost a couple of the balls. I can’t say that this next piece is particularly attractive. It is a garish plastic object that contains approximately 10 small balls – some with bells inside, some with rattles. What I can tell you is that it is most beloved in our house. 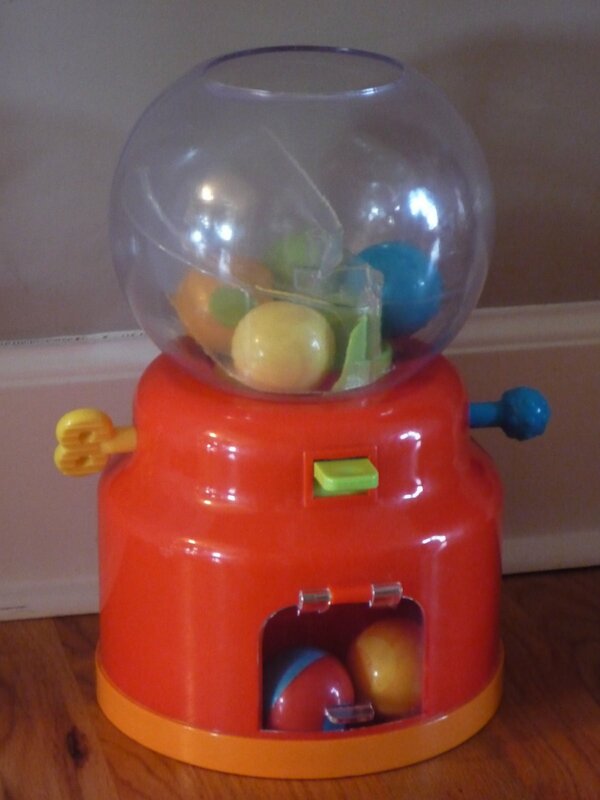 We call it the gumball machine, for that is what it looks like. I’m not sure of its actual name, it was a gift as well many years ago. Regardless, hours of fun are had with the baby teaching her to find the ball, drop it in, push the yellow button, open the little door, take out another ball and do it all over again. On the back side of my couch I have arranged 3 small bins of toys. They are grouped according to themes. From left to right, “things to take apart,” “things that go,” and “loveys and all things with tags“. A humble little grouping, but it sees a lot of action during the day. I can see these bins of toys from my desk in the learning room which is nice. This is Doodlebug’s favorite bin. I had to wait until she was napping to get this picture because if she had seen that all the rings were stacked, cups nested, beads snapped together…she would have set out with reckless abandon to dis-assemble everything here! 🙂 If she is unhappy I need only put a few toys back together from this bin and she is happy “taking apart” again! That’s it for the living room. 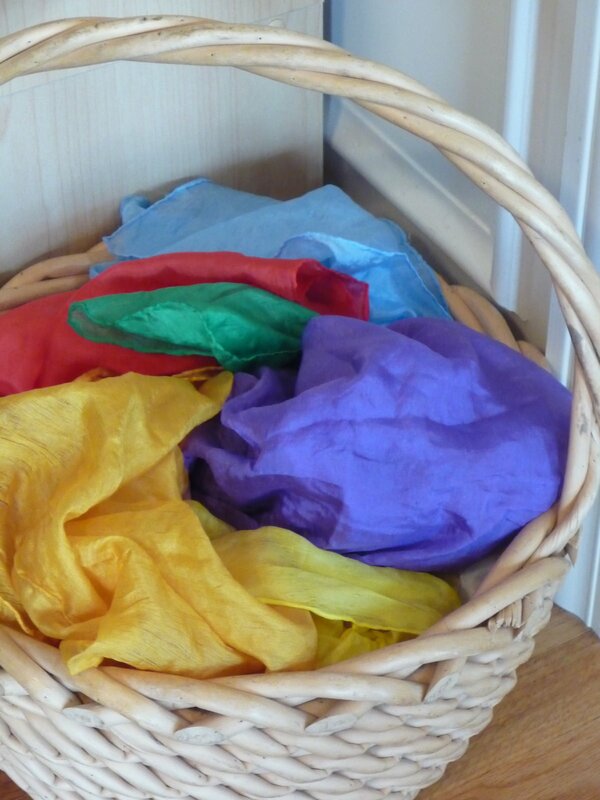 Next to the baskets of blocks you can see our basket of playsilks . These are used every.single.day. By everyone. Sometimes they are a part of the Feast Table display. Other times they are part of dress up play. Never have I gotten so much bang for the buck! 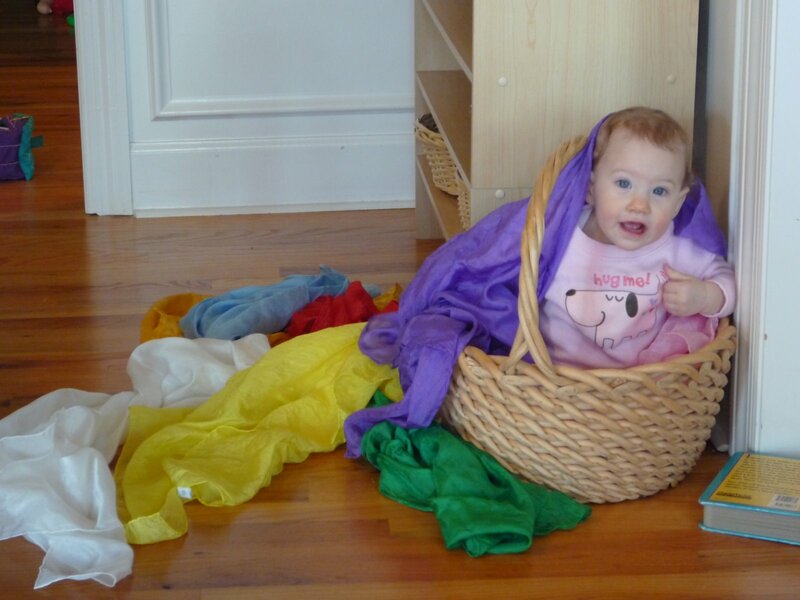 On a daily basis, Doodlebug climbs into the large basket and plays with the silks. I timed her on this day. She pulled and inspected and lifted and looked through and covered and threw and grabbed…and then got distracted by a tag on a silk (also silk 🙂 )…and then played some more…for 44 minutes. That is a very long span of time for an 11 month old! The picture books actually live on this shelf just outside the learning room in the hall, but it is close enough that we think of it as part of our learning room. We had to turn the pretty shelf around in order to protect the more fragile paper books on the other side (it’s on big wheel casters though, so it’s no problem to turn). This exposes all of the board books. They are much loved! Back in the learning room, I thought I’d give you a peek at Peanut’s table. I think I’d like to do another post on the fun things he and I do together during the days. Our days are quite relaxed. Though he seemed very interested in learning his alphabet at the beginning of the year, he really is not interested in that right now. He does love reading his books though!!!! I can hardly keep up with the stacks of books he brings me to read. Each week, I try to thoughtfully set up a few books around a theme that he seems interested in. Lately, it’s been all about animals! 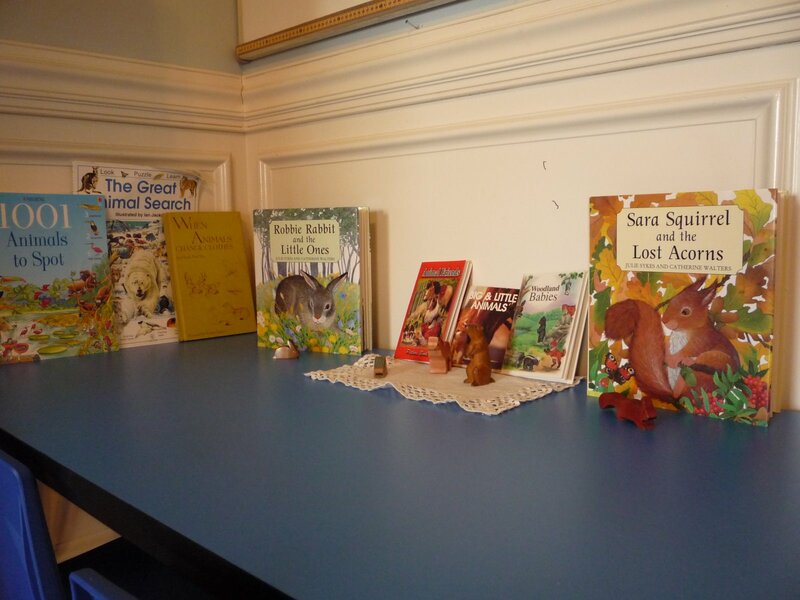 We have oodles more animal books, but we’re so enamored with Sara Squirrel and the Lost Acorns and Robbie Rabbit and the Little Ones that we just can’t bear to move on to anything else yet. Can you see the squirrel and rabbit along with the other wooden figures down there on my loud blue table? They’re so fun! 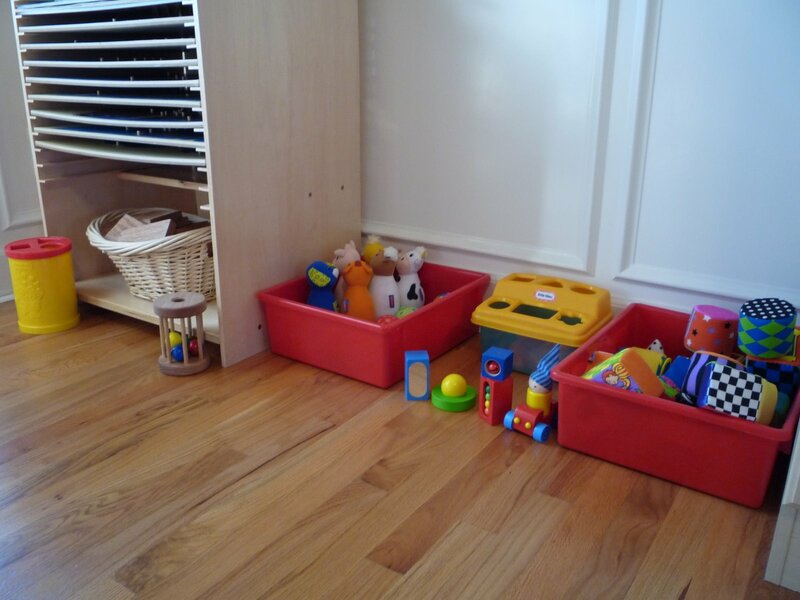 Finally, we have set up a few more bins and baskets in this corner of the learning room. One is filled with a small bowling set (again from my sis! She finds the cutest stuff for my kids!) and the other is filled with a neat set of fabric covered building blocks. Come to think of it, those are from my sis as well. Right up front and center is an adorable set of Haba blocks . The shape sorting blocks have been a huge hit with both Doodlebug and Peanut. Maybe I should rename this Kinder-corner the A.K/U.C Korner…’cause see that basket of gorgeous oak blocks? Those were made by my brother for Sweet Pea when she was just a tiny thing! And here she is. 🙂 This picture makes me happy. 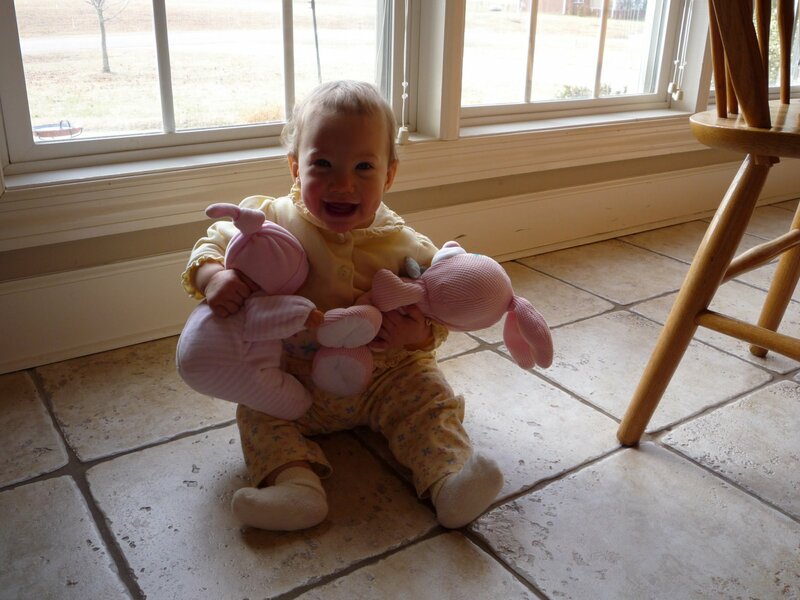 She has Sally Bunny – a much beloved pink bunny of Sweet Pea’s and her night-night dolly. Doodlebug is a happy, adorable little girl who will celebrate her 1st birthday in just under a month now. Has it already been a year? I can hardly believe it! I hope you’ve enjoyed my little tour of the Kinder-spaces for my little Doodlebug and Peanut! It was fun tidying up for you and taking pictures! I’ll try to get a post together of Peanut’s learning spaces soon. He and I have had so much fun this year! You have the lovliest home and it inspires me. 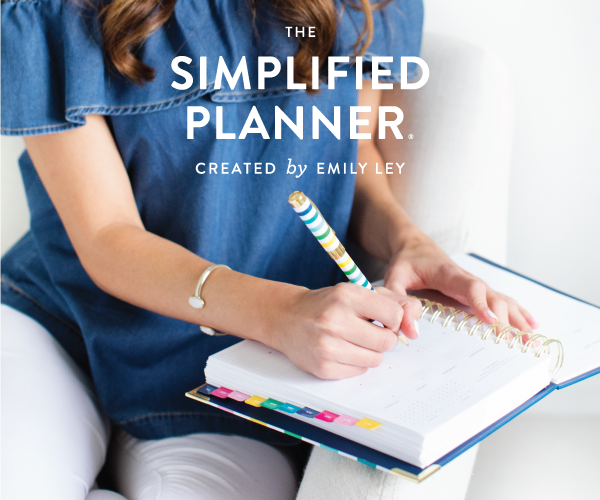 It is so functional and simplistic. Great job with everything! Thanks for the tour! Everything looks so lovely and inviting – I want to come and play. 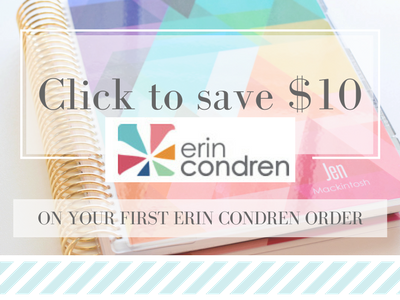 Thank you so much ladies for your kind and encouraging words.Andie – If I had to recommend 10 infant/toddler items to have in my home as must haves…1. Playsilks2. Stacking toys (without noisemakers)3. Nesting bowls4. 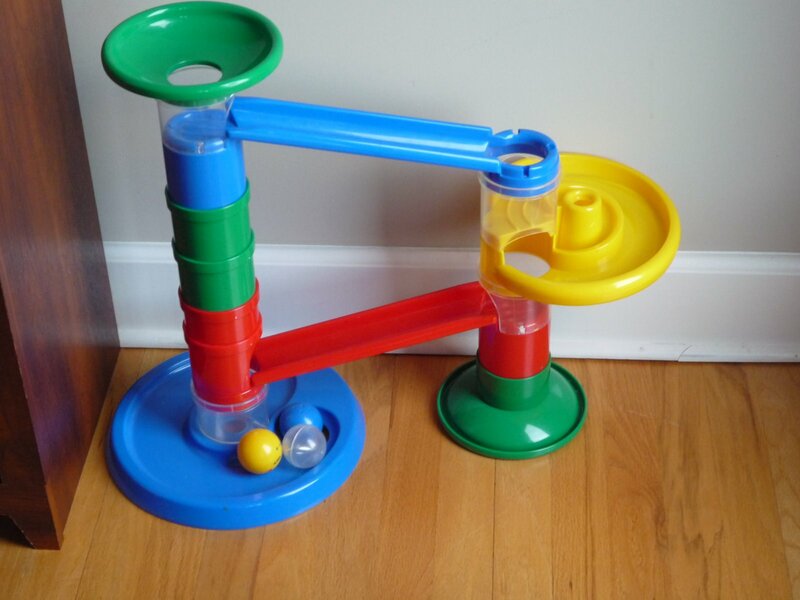 A cause and effect toy – something like a ball track, or a gumball machine5. Fabric blocks – and lots of ’em6. Puppets, puppets, puppets (no need for an expensive puppet stand – hang a sheet or have your puppet show behind the couch, but have lots of wonderful smallish puppets for the toddlers especially!)7. We love our little bowling set! 🙂8. Nesting blocks – choose beautiful ones! Check out http://www.finewoodentoys.com for a great selection!9. 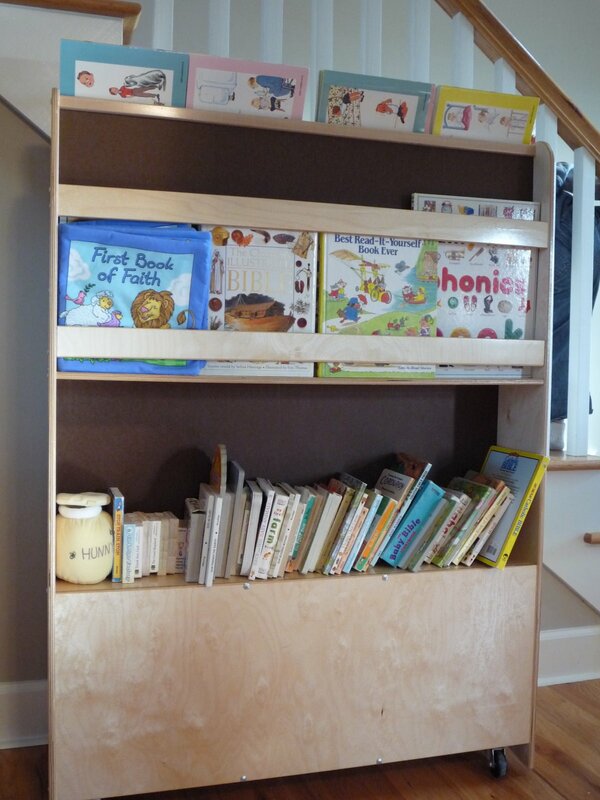 A book center with puppets or small wooden figures to bring stories to life10. A small kitchen. 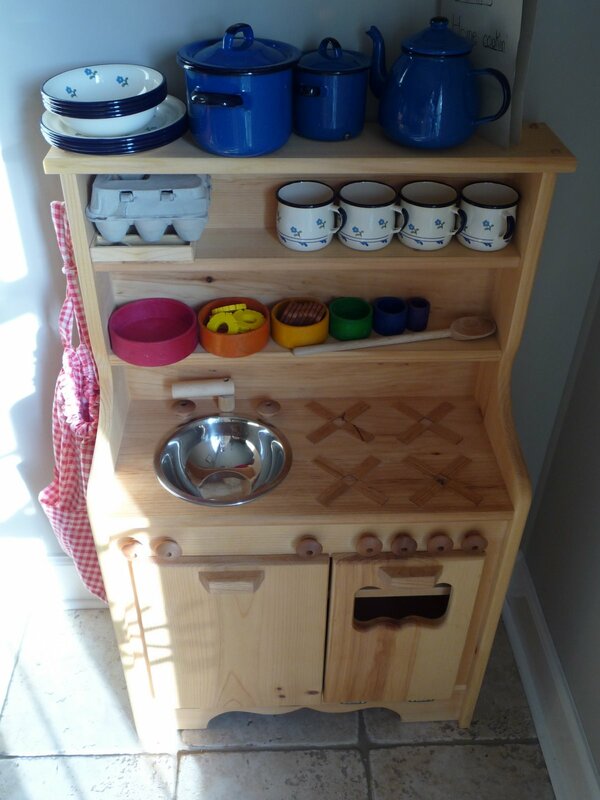 Now don’t kick yourself for giving your little kitchen away…rather than setting your sights on a brand new play kitchen right now, why not consider cleaning out one of your lower cupboards and setting it up as a play kitchen or find a low shelf and bring it into your kitchen and re-purpose it as a kitchen play area. Less is more here. More is just overwhelming. Set out a few lovely and basic pieces for play. Fabric food made of felt is easy to make and inexpensive (and makes no noise when it hits the floor!!! 😉 )Hope these ideas can get you rolling, Andie! Don’t forget your local thrift store! Often, I find many treasures disguised as something else entirely there! Good luck! I really enjoyed this post. I’m working towards this type of organization. Thanks for the inspiration! I don’t have really small children anymore, but I really love what you’ve done! Do you think I could buy some silks for ME??? 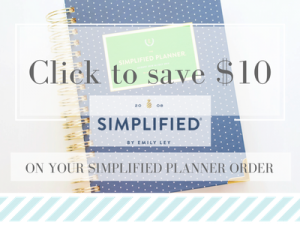 I just found your blog, and I love this post. I was wondering where you got that fantastic little nesting dollhouse? 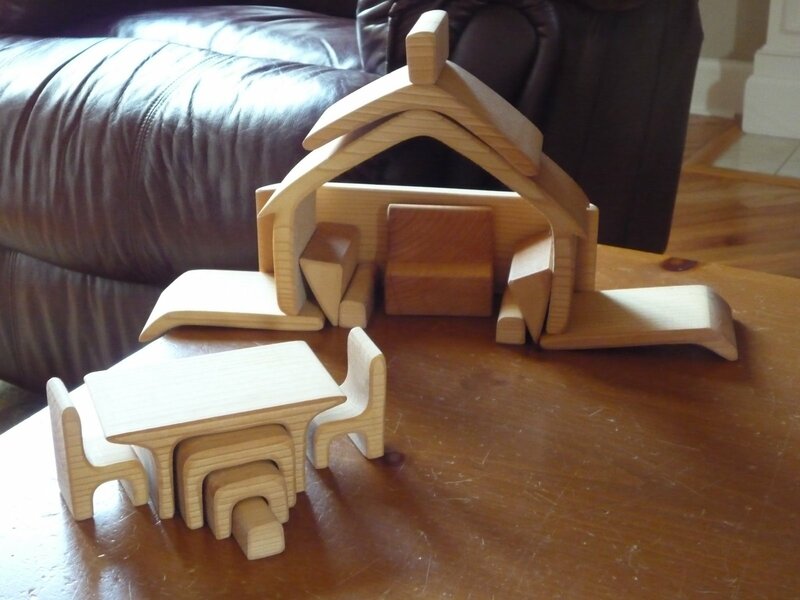 I'm pretty sure I got the little wooden nesting house from finewoodentoys.com. Just want to subscribe and do not have any comment other than, thank you so much for all you do!